Halloween Fundraiser to benefit BLMP! 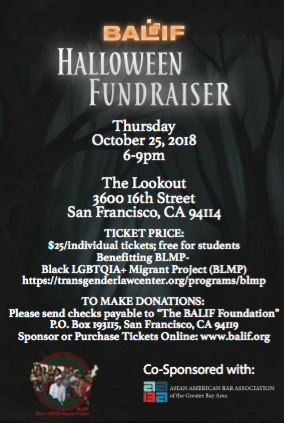 BALIF is teaming up with Asian American Bar Association of the Greater Bay Area (AABA) to throw an incredible fundraising extravaganza to benefit the Black LGBTQIA+ Migrant Project (BLMP). We have an incredible location, and our costumes and entertainment will not disappoint. All we need is YOU and your sponsorship funds to make this event a success. Who is BLMP? BLMP is housed at the Transgender Law Center and was created to address the ways in which the BLMP community is targeted by the criminal law and immigration enforcement system, marginalized in racial and economic justice movements, and minimalized in the broader migrant community. BLMP combats isolation and aids its members by holding community-building events across the country, providing legal services, and much more. Learn more about BLMP here. When and Where is the Event? 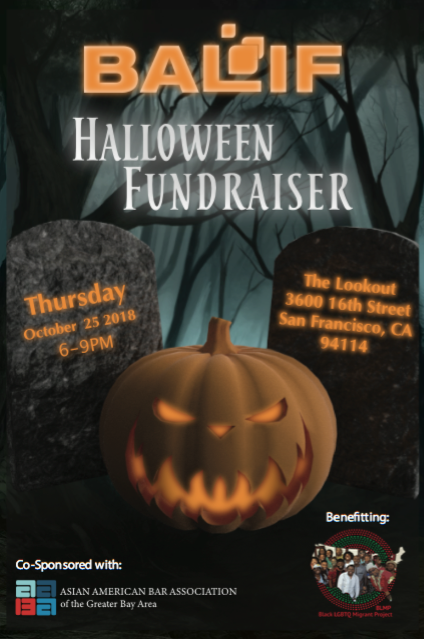 It is at the Lookout (3600 16th St, San Francisco) on Thursday, October 25, 2018 from 6 to 9 pm. How Do I Sponsor? We have multiple sponsorship levels to fit your budget: $2,500, $2,000, $1,000, $500, $250 and $150. Do not be shy about stretching your sponsorship pledge—BLMP and the BALIF Foundation are both 501(c)(3)s! Examples of what your funds cover and details on your sponsorship benefits are attached and available online here. If you cannot sponsor this year, you can still attend the party and raise critical money for BLMP. Tickets are $25 at the door and every dollar benefits BLMP, so bring lots of friends. (5) Fifteen drink tickets at door. (5) Ten drink tickets at door. (4)Six drink tickets at door. (4) Five drink tickets at door. (4) Three drink tickets at door.